Home Categories Vitamins & Supplements Four Paws Scratching Post With Catnip 20"
One reason that cats naturally like to scratch things is to trim their claws. 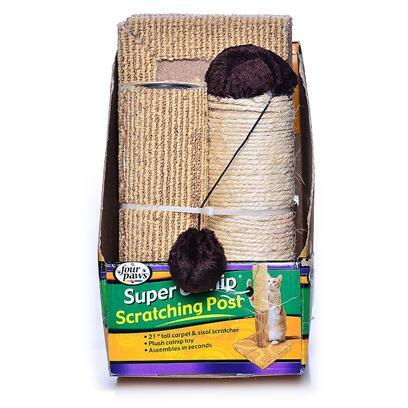 The Four Paws Scratching Post with Catnip is perfect for cats to maintain healthy claws. Cats' claws are constantly growing, and they regularly claw at all sorts of things to get rid of the sheath encasing each claw. Unfortunately, they occasionally claw at your furniture. They'll want to scratch at this post to gain access to the catnip within, but they'll also enjoy grooming their claws. You'll love this post because it will help keep your cat happy and your furniture safe.